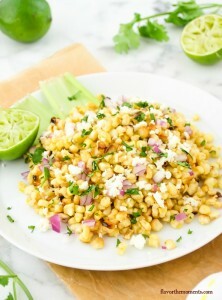 Grilled Mexican Street Corn Salad is authentic Mexican street corn in salad form, so you can load it with even more fixin's, and it's faster and easier to eat! It's perfect for your next summer barbecue. Preheat the grill to medium high. Rub the ears of corn with the paprika, then place on the grill. Grill for about 15-20 minutes, turning about every 4 minutes, or until nicely charred. Remove from heat and let stand until cool enough to handle. Add the lime juice, canola oil, red onion, chopped cilantro, cotija cheese, salt and pepper, to taste, and toss until well combined. Taste and adjust the seasoning as necessary. Serve, and enjoy! *I suggest starting with the juice of 1 lime and adding more if desired.